Here at Talking Bull we look ahead to the Bulls game against Ashton United at Edgar Street next Saturday. Hereford have now taken just a single point from their last four matches, and will need a win to boost confidence after a difficult month which has seen Peter Beadle’s side come up against many of the promotion favourites in the Vanarama National League North. Can the Bulls bounce back? Simon Wright casts his eye over one of the divisions smallest clubs. Ashton United are Curzon’s close neighbours, they play in the same town. Curzon have a smart stadium, massive community engagement, cheap admission and a modern website. Ashton, err, don’t. They are probably the smallest club at this level, with the smallest gates and are the bookies favourites for the drop. Their gate on the opening day was 273. Must be so hard for the Board and the volunteers to keep going when everything is stacked against them. As we mentioned before, the Greater Manchester area is stuffed with football clubs and Ashton aren’t even the biggest club in Ashton. But their saving grace is their social club. This is a hugely popular 7 day a week operation and it’s the profits from this operation that keep Ashton going. They made a decent start. They matched our goalless draw against Nuneaton on Day 1 and then recovered from being 3-1 down at FC United to win 4-3. Three days later, they were 3-1 at Kiddy before settling for a 3-3 draw. Heady stuff. And then reality dawned. Ashton are still use a Pitchero website, quite unusual at this level. Elsewhere, I think only Nuneaton have one which given the organisational shortcomings we saw in August isn’t so surprising. For those who aren’t familiar with the term, Pitchero is a very basic design, normally aimed at Step 5 or 6 clubs who require only minimum levels of content. If you want to make a football researcher scream, show him a Pitchero site. Last season. Ashton were promoted from the Northern Premier League via the Play-Offs. That was the fourth straight season they’d qualified for the Step 3 Play-Offs. In all, United have entered Play-offs 6 times and 17/18 was the first they’d won one. And that triumph came at a cost. Promotion got them noticed and their best players were lured away for instance defender Josh Granite moved to Barrow. Isn’t that a brilliant name for a defender, particularly a Northerner. Granite. Ashton hung onto 11 players from last season and added 10 newcomers. That’s a lot of new faces. This year will only be the second ever at Step 2 for Ashton. Unlike their Johnny Come Lately neighbours, United are a very old club with a low-key history right back to 1879. They have won the odd Miners Cup here and there I suppose but let me share just two points of interest. Ashton was Alan Ball’s first club. His Dad was manager and young Alan made his debut at 15. He played 7 Cup matches that season before he joined Blackpool. Secondly: United installed floodlights in 1953. Hard for the younger generation to take in but for the period, that was visionary. Literally visionary to illuminate a ball at night. That’s a full ten years before many professional clubs had lights. For a local example, of the big West Midlands club, only the Dingles had floodlights in the 1950s. All other clubs made midweek games in the afternoon. Anyway, back to Ashton. Their player manager Jody Banim is quite honest that their squad is made up of players overlooked by the bigger clubs in their patch. Banim played for 15 clubs, mainly North-West non-League sides with a dabble in Shrewsbury. By day, he’s sole Director of a Football Academy. Notice the trend here? We’re only in September and Banim is the third opposition manager so far who runs an Academy. 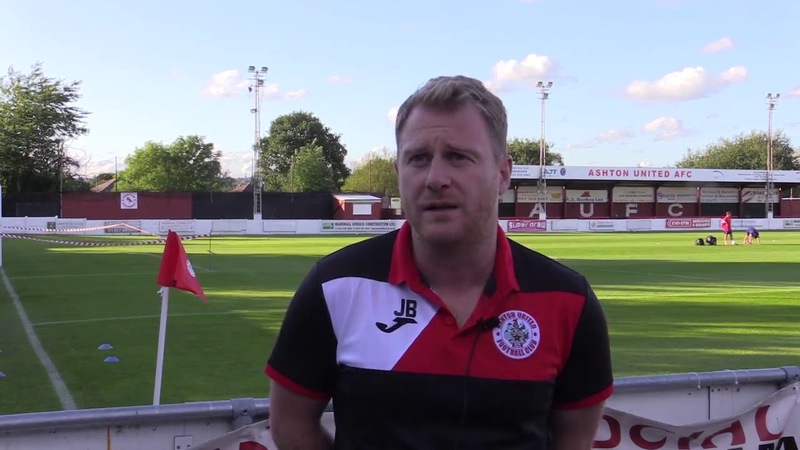 Just to mention there’s a fun video on the Ashton site when the media team were interviewing the manager after promotion and his team sneak up behind him with a bucket of water. Shades of Graham Turner at Brentford. No immediately recognisable names in the Ashton squad to tittivate our listeners. The manager is the only member of the Ashton squad with a Wikipedia page which is highly unusual at Step 2. I’ll highlight just a couple of names. Striker Oscar Durnin is son of former Liverpool and WBA striker John Durnin. Oscar previously played in the League of Wales. Ashton took a punt on a Step 5 player this summer. Zac Dale was an attacking midfielder with Barnoldswick Town (another proper Northern name) last season. Impressive stats for Dale: scored 34 times from midfield, secured Man of the Match 18 times and voted Player of the Year in the NW Counties League. Their squad seems rather hairy. Every striker has various versions of moustaches or beards. They’d be set up for a mass audition for a spaghetti Western. I appreciate its cold on exposed skin oop North. Maybe their commercial manager should be talking to local hairdressers about a sponsorship deal? Ashton have struggled to make an impact so far, with just one victory in their opening nine league games, and that was at FC United of Manchester in their first away match of the season. Against the top sides in the division Ashton have been thoroughly beaten. They lost 5-1 to Brackley at home on the 18th of August, and last weekend got trounced by league pacesetters Chorley 5-0, also at Hurst Cross. The Robins have though picked up some useful draws on the road including a dramatic 3-3 thriller at Kidderminster Harriers, together with a 2-2 draw at Southport. However, they will arrive at Edgar Street without a victory in seven games, and on the back of three defeats in the last five. Hereford need a win. It’ll be a worrying sign if this cannot be achieved against Ashton.